News this week of what is likely the first pedestrian fatality caused by an autonomous vehicle illuminated ongoing safety concerns around emerging driverless vehicle technology — and rightfully so. A self-driving car from Uber hit and killed a woman in Tempe, Arizona, on Sunday, March 18, 2018. The woman was reportedly crossing a road outside of a crosswalk when the vehicle, operating in autonomous mode under the supervision of a human safety driver, struck her, according to the Tempe Police Department. Additional details from this incident are not yet available. But a look at pedestrian deaths in general is illuminating. In 2015, 5,396 pedestrians were killed and another 70,000 were injured, according to National Highway Transportation Safety Administration (NHTSA). This equates to a pedestrian being killed every 1.6 hours, and injured every 7.5 minutes. Pedestrian fatalities rose by 11% from 2015 to 2016, likely due to lower gas prices putting more cars on the road, and distracted drivers and walkers. Most pedestrian fatalities (74%) occurred in the dark. Consider that neither a human driver nor an autonomous vehicle can easily spot nighttime pedestrians wearing dark clothing. Early reports from the Uber crash indicate the incident happened at about 10 p.m. Between March and May, most pedestrian fatalities occur between 9 p.m. to 11:59 p.m. Most fatalities occur at non-intersections. In fact, given the existing statistics, this accident was not unusual, other than the fact that an autonomous vehicle was involved. 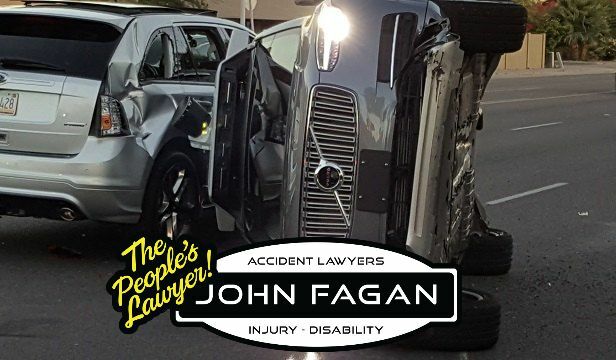 Most of the details surrounding Uber’s collision in Tempe have not been released, but if the collision was easily foreseeable and avoidable, questions will arise regarding Uber’s safety protocols and the effectiveness of its self-driving technology. And, a number of other questions remain. For instance, might the victim have darted suddenly in front of the vehicle, providing no time to stop? While autonomous vehicles supposedly stop faster than human drivers, if the pedestrian was not visible to the vehicle or the human driver, the fault will lie with the pedestrian. The difficulty here will be getting people to analyze this accident for what it truly was, and not jump to conclusions that autonomous vehicles are more dangerous than those driven by human. Will the manufacturer of the vehicle be held liable? Will the safety driver be held liable? Will the pedestrian be at fault for walking into the road? Or, will this be seen as simply an accident with no one actually at fault? Regardless of how the details help determine liability in this pedestrian fatality, human safety has been a pressing concern since autonomous vehicles were first discussed. However this sorts out, it will be incredibly significant for the future of autonomous vehicles, their liability and insurability.